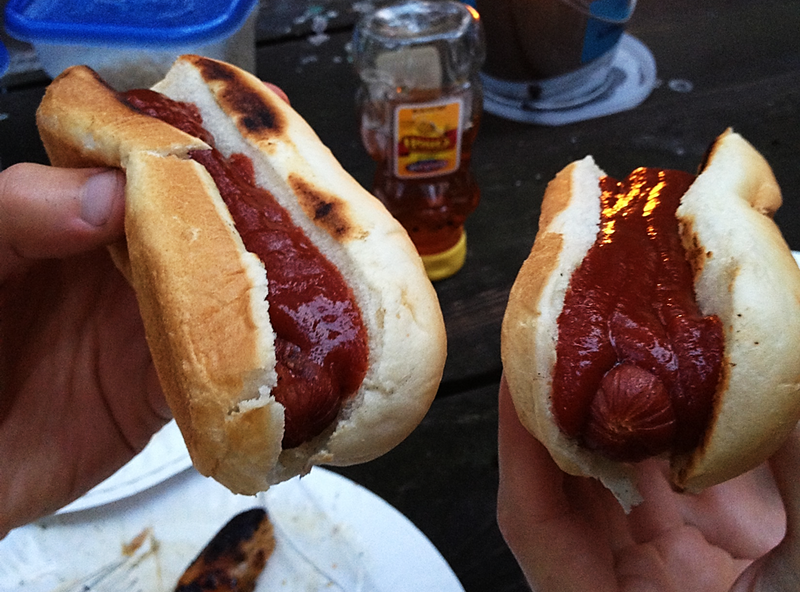 To this day, sometimes I crave ketchup and go out of my way to make or buy something I can eat it with. Just ask the server at America’s Dogs in O’Hare International Airport. Despite signs on the menu and on the counter prohibiting ketchup on their hot dogs, I asked anyway, fully expecting to be teased for a moment then given ketchup to round out my meal. Instead, I was turned down. The server looked at me blankly for so long that I actually glanced around the food court looking for other restaurants that might lend a customer in crisis some extra ketchup packets. Having mentally struck out at Jamba Juice and Auntie Anne’s, I looked back at the server, put on my best sad puppy face, and explained that where I’m from, I eat ketchup on my hot dogs and would he please make an exception for this confused East Coaster (never mind the fact that even my own dad, a Brooklynite at heart, balks at ketchup on hot dogs). Finally, the server sheepishly reached under the counter and flung two (only two!) packets of ketchup my way, all while suspiciously eyeing the security camera as if this act of hot dog treason would get him fired or me arrested or both. This past weekend, Palate Guy and I finally made our summer trip up to my beach house. Despite the clouds and the cold, we were still glad to be “welcomed to paradise,” as we all say, and to enjoy a quiet long weekend by the ocean with my immediate and extended family. We were assigned responsibility for Sunday dinner for everyone. 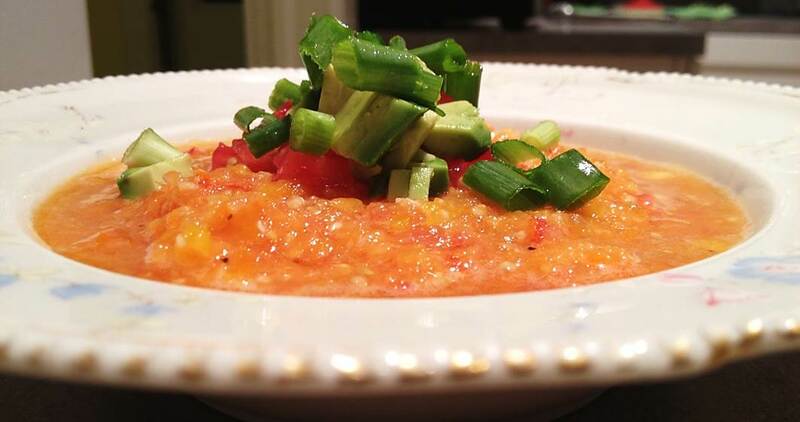 Thumbing through the taste buds of our memories, we settled on a starter that was sure to please: golden gazpacho. This variation of the cold soup standby seemed foolproof yet special enough with its welcoming orange color and fresh, cool feel. One grocery store run, one food processor, and a few hours of chilling later, we sat down to enjoy the last dinner of the last day of the last weekend of summer. PS: As for my grandmother, she did indeed make an appearance at the beach house that day. Since she could not stay for dinner, we made sure to send her home with a tupperware of golden gazpacho, this time a tomato soup with her wholehearted approval. Adapted from Whole Living’s recipe. The recipe described below serves about 10. We found it was great the first night and even better the next day…when we ate it for breakfast. 1. 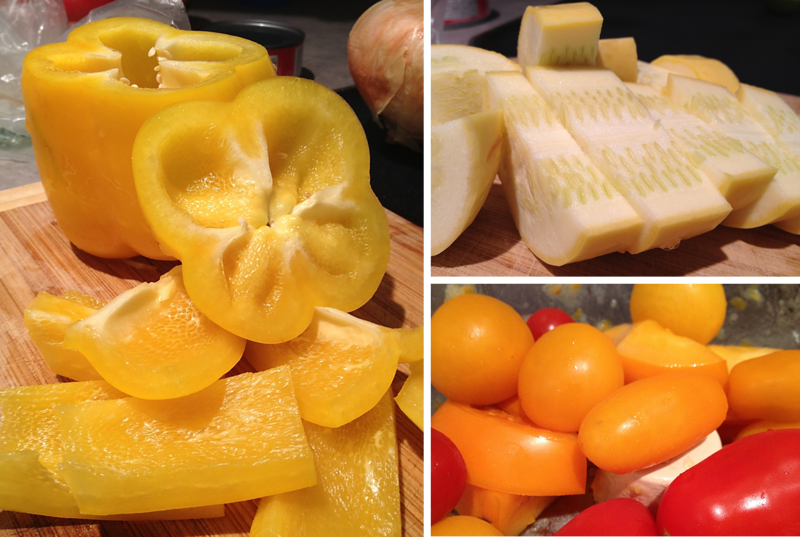 Combine tomatoes, onion, squash, bell peppers, garlic, carrot juice, and olive oil in a food processor. Pulse in batches to blend to desired consistency – some people like it fully pureed, but we left it a bit chunky. 2. Add salt, pepper, sriracha, and red wine vinegar to taste. 3. Chill for 2+ hours or until cold. 4. Serve garnished with diced avocado, tomato, and scallion. 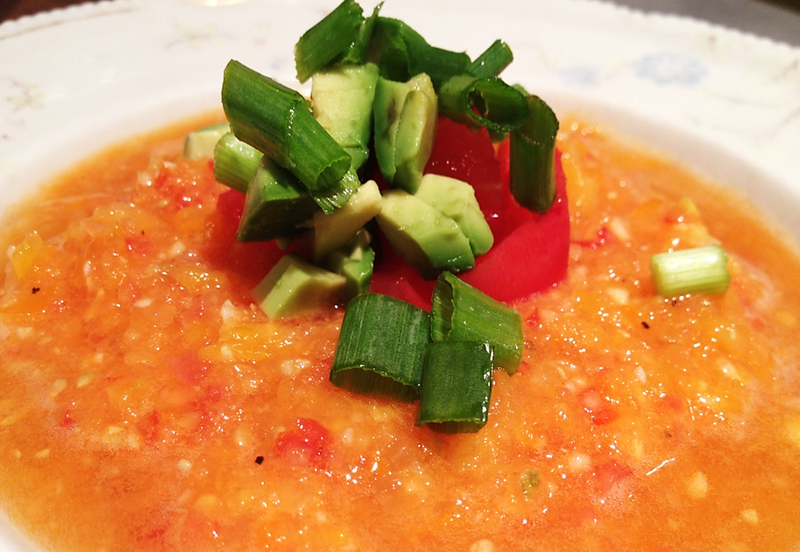 Having been at the dinner in which this soup was served, this gazpacho will now be my go-to summer cold soup, far exceeding in flavor the version I have been making for years. Wow – that’s a big statement. Glad it was so tasty. Yes, especially tomatoes this time of year. And as for Chicago, no need to apologize. I get tradition as much as the next person, I just couldn’t believe they refused me ketchup from a business perspective!